Professor Dr Oludayo, O. Olugbara graduated from the University of Ilorin in 1991, achieving a first class Bachelor of Science (Hons) in Mathematics. He was thereafter retained by the University of Ilorin to work as a junior research fellow in 1992, after completing the national youth service corps. As a junior research fellow, he registered in 1993 for a Master’s Degree in Mathematics with specialization in Computer Science at the University of Ilorin and completed the degree in 1995. He holds a PhD degree in Computer Science from the University of Zululand in South Africa. Being a retained junior research fellow at the University of Ilorin marked the commencement of his academic career. He was promoted to the position of Assistant Lecturer in 1995, Lecturer II in 1996 and Lecturer I in 1998. He was appointed Lecturer I in 2002 at the Covenant University in Nigeria and promoted to the position of Senior Lecturer in the same University in 2005. In 2010, He was appointed an Associate Professor of Information Technology at the Durban University of Technology in South Africa and became a full professor in 2011. He was appointed Visiting Professor of Computer Science in 2015 by the Covenant University in Nigeria. Prof Olugbara has developed a special inclination towards scientific computational methods in the specialized areas of machine intelligence, mobile computing, image processing and exponential technology for smart city development. He is deeply committed to the use of scientific methods to create relevant, insightful and effective solutions to critical problems facing the society. He has engrossed himself in conducting applied research in his chosen areas of specializations, guiding Masters and PhD projects as well as stimulating students to acquire computing skills at undergraduate and postgraduate levels. He have successfully graduated over 250 Undergraduate degree students, 28 Master’s degree students and 11 Doctorates in Computer Science and Information Technology. He has so far published more than 120 research papers in national and international journals, book and book chapters as well as conference proceeding articles. He has attended many international conferences and workshops throughout the world and chaired some technical sessions. Prof Olugbara is a holder of academic awards and scholarships, including the International Federation of Information Processing (IFIP) TC2 sponsored by Microsoft Research Cambridge in 2007 and meritorious research paper award at International Conference on Machine Learning and Data Analysis, organized by the IAENG International Association of Engineers, San Francisco, USA in 2012. He is a University Scholar at the University of Ilorin, Member of Marquis Whos’ Who in the World (USA), Member of the Association for Computing Machinery (ACM, USA), Member of Computer Society of South Africa (CSSA) and other academic associations. He was awarded honorary referee of the Maejo International Journal of Science and Technology, Thailand in 2007-2010 and 2011. In December 2015, he was awarded an outstanding scientist by the Center for Advanced Research and Design of Venus International Foundation in India. He became an established researcher courtesy of the National Research Foundation (NRF) of South Africa rating in 2017. Prof Olugbara has examined a number of postgraduate theses, dissertations and assessed research publications for professorial appointments both nationally and internationally. He is a reviewer for many reputable Journals, including Journal of Computers in Biology and Medicine (ScienceDirect), Computer and Program in Biomedicine (Elsevier), International Journal of Computational Vision and Robotics (IJCVR) (Inderscience), Personal and Ubiquitous Computing Journal (Springer), Journal of Applied Mathematics (Hindawi), Agronomy for Sustainable Development (Springer), IT Professional (IEEE Computer Society), International Journal of Computational Vision and Robotics (Inderscience), South African Computer Journal, African Journal of Information Systems (Digital Commons) and Behaviour and Information Technology (Taylor and Francis). He is a member of the Editorial Board of Signal and Image Processing: An International Journal (SIPIJ). An Editorial Board member of Electronic Journal of Information Systems Evaluation. He was invited in 2014-2017 by the NRF to serve as a reviewer. He is the leader of the ICT and Society (ICTAS) Niche Research Group and the Vice Chair of Space Science Research Group at the Durban University of Technology in South Africa. 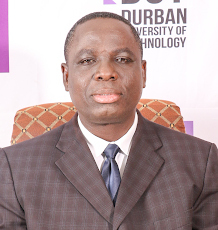 He is currently the Executive Dean of the Faculty of Accounting and Informatics at Durban University of Technology. He serves on numerous committees of the university.